Following the July 6, 2016 release of the U.S. State Department’s “Report on Human Rights Abuses and Censorship in North Korea,” the U.S. Department of Treasury commendably followed up on July 7, 2016 by naming several North Korean organizations and individuals to the Specially Designated Nationals List, which correlates to sanctions on those entities. Most of the North Korean organizations and individuals named have a direct impact on the Kim Regime’s political prison camps, which incarcerate up to 120,000 individuals and their families. Control of these camps is frequently presumed to be a function of the North Korean state—the Democratic People’s Republic of Korea (DPRK)—but that would be a narrow understanding of how and why the camps operate the way they do, and more pointedly, why they exist in the first place. These political prison camps started with the early Kim Il-sung regime’s concept of banishment of those deemed enemies of the party and state—religious persons, landowners, businessmen, those that cooperated with the Japanese colonial government in Korea, and even those deemed too popular locally—to North Korea’s mountainous northeast. These banishments developed into the current form of actual political prisons concurrently with the development of the Ten Principles of Monolithic Ideology (TPMI). Loyalty to the supreme leader, Kim Jong-un, is the supreme principle of the TPMI. Developed in the late 1960s and promulgated for instruction to all in the early 1970s, every North Korean must demonstrate his or her loyalty based on TPMI principles. Violation of these principles is the number one justification for the regime to incarcerate individuals in these camps. Not only does the TPMI serve as the guidebook for all party members, security services, government leaders, and action personnel with regards to violations of loyalty and political ideology, it is also used as a standard to which every leader, manager, and department director is held in the performance of their respective duties. This applies as well to those who run the political prison camps and who provide administrative and/or logistical support to those camps. Within the Kim Regime, chains of political control are far more important than chains of command, regardless of organization type, and the internal security services are no different. The following line and block chart lays out how North Korea’s supreme leader of the Korean Workers’ Party (KWP) politically controls the political prison camps (and all other prisons) through the party apparatus. At the center of the control process is the organization that is responsible for ensuring the TPMI is followed statewide to the proverbial letter—the party’s Organization and Guidance Department (OGD). The OGD is the “party within the party.” Its mission is to guarantee the continuity of the supreme leader and the KWP. The OGD Party Life Guidance Section evaluates every leader of every organization, regardless of societal role, as to their performance on loyalty to the supreme leader and obeisance of the TPMI. The OGD Cadre Section employs these evaluations to manage leadership careers. 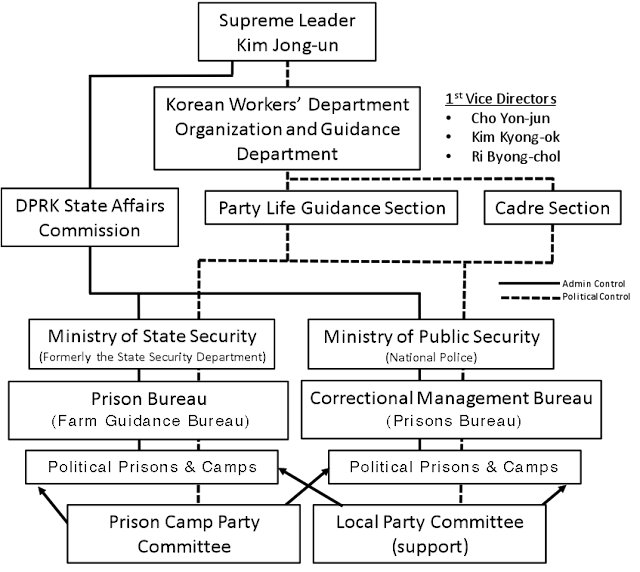 As in every other organization within North Korea, each political prison camp has its own party committee embedded into the camp structure and this committee takes its orders from the KWP OGD. It is the prison’s embedded KWP committee from which the prison takes its overall direction. The orders and direction provided by the camp KWP committee that direct the treatment of prisoners and these orders and directives must ultimately conform to the Korean Workers’ Party Central Committee. The most critical position in this camp KWP Committee is the Organizational Secretary. He or she oversees the efficacy of camp management in accordance with OGD orders and directives, as well as its continuity with the TPMI. The orders and directives of the KWP Central Committee are the responsibility of the KWP OGD. Thus, the actions and tasks of every leadership position within the political prison camp structure are sanctioned politically by the KWP OGD, which reports directly to the supreme leader. Each of those camp leaders, whether shift supervisors, section chiefs, or camp managers, must comply with the spirit of the TPMI and is responsible for the treatment they deliver to punish the camp residents. Sympathy and latitude toward the political prisoners is counter to the TPMI and punishable under the same standards that lead to the imprisonment of the camp prisoners. It is imperative for these personnel to punish political prisoners in accordance with the intent of the TPMI. Not do to so would result in the denial of food security, adequate housing, opportunity for professional advancement and, most importantly, family survival. Understanding political prison camp leadership behavior is embedded in understanding the TPMI and the control of the KWP OGD over the internal security services. Administrative analysis is totally inadequate in understanding a regime that derives its power from enforcement of a political ideology that controls the regime’s agencies of political power enforcement. See U.S. Department of State, “Report on Human Rights Abuses and Censorship in North Korea,” July 6, 2016. URL: http://www.state.gov/j/drl/rls/259366.htm. See U.S. Department of Treasury Resource Center, Office of Foreign Assets Control, “North Korea Designations,” July 6, 2016. URL: https://www.treasury.gov/resource-center/sanctions/OFAC-Enforcement/Pages/20160706.aspx. Not named are numerous North Korean elites who are responsible for supporting the operation of these camps politically, administratively and logistically. For an understanding of political prison camp development, see Robert Collins, Marked For Life: Songbun – North Korea’s Social Classification System, Committee for Human Rights in North Korea, 2012, pp.22-24; for details on the camps themselves see several related reports at hrnk.org/publications; also see several prison camp publications published by the Committee for Human Rights in North Korea at hrnk.org/publications. For a detailed translation of the Ten Principles of Monolithic Ideology, see Joanna Hosaniak, Prisoners of Their Own Country: North Korea in the Eyes of Witnesses (Seoul: Citizens’ Alliance for North Korean Human Rights, 2004), 39-44. Authors rendition.Derived from numerous sources. National Intelligence Service “Bukhan Nodongdangui haeksim Buseo (North Korea’s Korean Workers’ Party Core Department),”2006. URL: http:// www.nis.go.kr/app/board/view?sc_param=,M03180 000&midArr=M03180000&fieldArr=&keyWord=&page =1&startDate=&endDate=&dataNo=23452&hcode= 39077402012879299424981&viewNo=201. https://nkleadershipwatch.wordpress.com/the-party/city-municipal-and-county-party-committees/; see also Micheal Madden, “KWP Central Committee Organization and Guidance Department,” NKLeadershipWatch, October 2009. URL: http://nkleadershipwatch.files.wordpress.com/2009/10/kwpcentralcommitteeorganizationandguidancedepartment.pdf; see also Ri Myong-hun, “노동당 내부사업 실상과 조직지도부 65과 (Status of Korean Workers’ Party Internal Affairs and the Organization and Guidance Department’s Section 65),” Pukhan, August 2014, pp.85-91; see also “Pukhan Chongchiron: Choson Nodongdang Chungangwiwonhoi Chojik Chidobu (North Korean Political Theory: Korea Workers’ Party’s Central Committee’s Organization and Guidance Department),” Report Shop, Augugst 7, 2010. URL: http://www.reportshop.co.kr/dview/455102/9062471347817998.